Really? You want the President to invite all 32 teams every year, and not just the Champions? Right...and hey, Harrison. You should check your helmet. I don't think its protecting your brain all that well. You gotta give credit to Ken Macha and the Brewers. They play in arguably the toughest division in baseball, lose CC Sabathia and Ben Sheets and still have the second best record in the NL. And with one quarter of the season done, they lead the free spending Cubs and may have found a new young ace in Yovani Gallardo. Another team that deserves credit are the Texas Rangers. From last year's league-high 5.37 team ERA to this year's 3.13 team ERA—MLB Best—the team seems to have everything rolling. Nolan Ryan called out his pitchers in Spring Training, saying that have to pitch through pain and last longer in games, something his pitching coach Mike Maddux echoed. Seems to have worked. Always knew the Rangers could hit. If they can pitch this well for an entire season, they will be a force to contend with. Can't wait for the Lakers—Nuggets series. I have a feeling that that series could be the most fun one in all the NBA playoffs. They should say if everyone is doing it, let them do it. But if they do it, they’re not entitled to go to the Hall of Fame if they got Hall of Fame numbers. Wow. A "One Strike and You're Out" policy and no Hall of Fame. 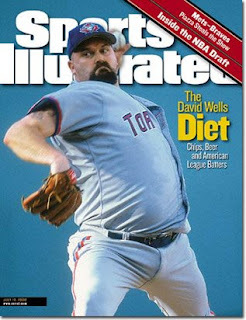 Hate to admit this; I always though Boomer Wells was a bit of a knucklehead, but he's got some good points there. And, of course, you know that guys was never on any steroids. GM Scott Pioli used his first two draft picks on versatile defensive linemen: LSU’s Tyson Jackson and Purdue’s Alex Magee. Although neither played in a 3-4 in college, each has the skills necessary to line up at end in the “30” front. 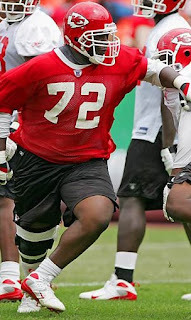 And, from what we hear, this is the duo the Chiefs would like to anchor their D-line for the foreseeable future. Very interesting. But it does beg one question. Why didn't the Chiefs trade Dorsey (to the Falcons along with Tony Gonzalez, for instance) if they felt they didn't have a use for him? Call me crazy, what with Grienke out there pitching like a madman, or Johan pitching great, but for my money, if I had to select one pitcher for one game, right now, I'd take Roy Halladay and I wouldn't even have to think twice. And finally, in the "Dummy" news of the week, we go to Urban Meyer. Apparently, Meyer didn't like the fact that former Gator QB, Shane Matthews—who played over a decade before Meyer ever stepped foot in Florida—was criticizing Meyer's game strategy during Florida's upset loss to Mississippi. "If you want to be critical of a player on our team or a coach on our team you can buy a ticket for seat 37F, you're not welcome back in the football office," Meyer said, according to the report. "You're either a Gator or you're not a Gator." Oh really, Urban. That has gotta be the dumbest thing I've ever heard. So should Cris Collinsworth never criticize the Bengals even if he's covering a game there? Or should Doug Flutie never criticize Boston College? Or what about Terry Bradshaw and the Steelers? Give me a break. Shane Matthews is a radio commentator. His job is to give his opinion about college football. He's not paid to pledge allegiance to his former college program. And what's more, Urban, you should know that. You're a great coach. Don't be so thin-skinned. As a Ranger fan, I am cautiously optimistic about them so far. I will just wait and see how the pitching is doing when they are pitching in 100+ degree weather in June, July, and August. When they typically wilt away. I love that Nolan has taken such an active, hands-on role.